Psalm 81:1-3 – Sing aloud to God our strength; shout for joy to the God of Jacob! Raise a song; sound the tambourine, the sweet lyre with the harp. Blow the trumpet at the new moon, at the full moon, on our feast day. Ahhh music! God has been generous to give me the gift of music. I love playing music on guitar. I love listening to others play music. Most importantly, I love participating in a church service while the music is playing and I can focus completely on Him as His house fills with beautiful voices lifted to the heavens like a fragrant offering. God is AWESOME!! Being a worship leader is a wonderful experience and as a leader it is important to do the job right. We as leaders have a great role to play in a church service and there are some things to keep in mind when preparing for and participating in the worship service. As Christians, we are connected to an everlasting life-source, God. He is our strength and spiritual nurturer – Psalm 71:7b – You are my strong refuge. If we are to have our hearts right before God as we enter into leading, we must have a relationship with our Creator. When we spend time in the Word and prayer, we are really telling God that we love Him as our Father and that we love the relationship that we have with Him. When we are growing in God, then we can be confident to enter His house and lead His people in song. It is vital that as musicians we know what songs we are playing/singing and that we have put time into playing/singing them before we lead corporate worship. 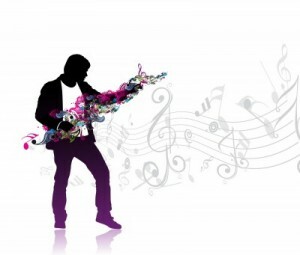 I have learned that even if I have played a song 50 times, I always play better when I have rehearsed it ahead of time. Sometimes things get changed up, such as: omitting verses and singing extra choruses. Most importantly, I love participating in a church service while the music is playing and I can focus completely on Him as His house fills with beautiful voices lifted to the heavens like a fragrant offering. I usually arrive to church 15 minutes before we do a practice run in the morning. This gives me time to set up my equipment and to do a quick run-through of the songs one more time. When doing this I am able to warm up my fingers and get my mind focused on the songs. For singers, the car ride to church is a great time to warm up the vocals. If you start to get nervous on stage, you may show it. When I first got into leading worship years ago, I would get nervous and my hands and fingers would sweat. Everyone that plays a guitar knows that sweaty fingers drop pics. It is important to remember that you are leading worship for God. The church service is where you bring your worship. So, concentrate on Him. I promise that you will forget about the people when you come into His almighty presence with worship. Everyone else fades away when you concentrate on Him. A good night’s rest is an amazing tool to help you get going. A proper amount of sleep gives you the energy and stress-relief to start the next day energized. Don’t forget that you are representing the church when you play. If you make mistakes just because you’re tired, it will not look good. Newcomers to a church want to see a church that is alive! So get that rest and show them how much you love God! This may sound silly but food nourishes the body and mind. With a proper breakfast you will be able to do your best during service. It can be difficult to do anything in life while your stomach is growling at you. Instead of focusing on what you should be, you will focus on fixing your hunger. The focus should be on God. That is why you are there. This is the biggest one of all. Matthew 5:23-24 says, if you are offering your gift at the altar and there remember that your brother has something against you, leave your gift there before the altar and go. First be reconciled to your brother, and then come and offer your gift. I think that it is also implied that if you have something against someone, you must also forgive them as well before offering your gift. Being able to lead a congregation in worship is a gift, not a monetary one but a spiritual one. This is a very wise verse because if you have something against someone and it is bothering you, you won’t be able to give your entire being to worshiping God. You will be thinking of who wronged you. Even if you cannot get to them to reconcile, you must be able to forgive them anyway and let go of what they have done to you. Then you will be able to participate fully. I hope and pray these tips will spur you on to strive for excellence. Our God is an awesome God! He deserves our best! God bless! Looking for some more music related articles? I realize there is much that can be said on this topic. If you were to ask 12 different Christians their thoughts on music in the church you would probably get 12 different opinions. Let me state that I’m not a musician (the only thing I can play is the radio) but that does not mean I don’t appreciate music as it is incorporated properly in the church of Christ and all the preparation that is necessary. There’s no denying that music plays a role in the worship of our Lord. We see that in the Psalms and the Word is where we must turn for all direction in every part of corporate worship. Not to minimize the role of the music leader, and I admit I like that title better than “worship leader”, I do think that preparing for worship, when it comes to the music anyway, has more to do with the listeners/participants than the leader. Yes, preparation is necessary and important but I think so much has been made of music in the church today, even to the detriment of the preaching of the Word and it’s in the preaching that I believe we then enter into true worship. Too often, it’s the case where congregants are being entertained by the “worship team” and not even singing themselves, so I’m not sure where the worship is happening. I appreciate the role you play in your church and thank you as you share in the gifts that God has given you but I think your article is somewhat anemic, not only in regards to music, but what worship really is and how we can all enter into it in a more God glorifying manner – whether it is through the Word or through music that edifies the believer and brings praise to our God. I appreciate the emphasis you put on preparing, especially the forgiveness element, in the role God has given you in His church. I undestand what you are saying, and I completely agree that music is not the only form of worship. Anything you do in the name of God is a form of worship. Music is very important to me because God has blessed me with this gift. That is why I put a lot of emphases on the preparation part. It is obvious when someone plays a wrong note or jumps to the wrong part of a song. This is a huge distraction and takes people away from the connection that they have with God in that moment. Im sorry you feel like we are entertainers. That completely defeats our purpose as worship leaders. I can tell you that no matter if Im playing or am sitting in service, I never think of it as entertainment. Your prefered title of “music leader” is more fitting to the entertaining side of how you view music. “Worship leader” is connected to leading people into worship. I absolutely love listening to sermons and absolutely worship is found there also. Don’t limit the glory of God to just preaching. “True worship” as you said is found in Romans 12:1. Presenting yourself as a living sacrifice fits anywhere that God can use you. God uses musicians and preachers alike for His glory. However we sacrifice our time for Him is worship. His glory is found in every part of the church(from maintenance to the music to the preaching). I don’t view music better then any other part of corporate worship, but my article is directed at being prepared to lead in worship so that is why I wrote what I did. Although I would disagree with much of your response, I always benefit and learn from reading all that the writers of this site have to offer. Thank you again for your reply! Maybe a good question to answer from What Christians Want To Know is – How does one prepare for Worship? That is a good idea Jeff. How does one prepare for worship would also be a great article. Once again, mine was focused more to the people leading worship through music then the congregation itself, which is also a good topic. Try not to think of worship as a one-way street. There are many facets to worship and all of them are important, including the one you mentioned on the sermon in your first post. When leading the body in worship we need to be completely focused on God. That was the main driving force behind my article. I want those leading worship to be completely focused on God when they lead the congregation. I imagine the article was not as valuable to you if you aren’t a worship leader and that is completely fine. Thank you for your thoughts. Thank you Pam! I agree with you both also, forgiveness is key in being able to focus completely on God! Interesting article, interesting comments. I am a vocalist member of a praise team that leads music once a month at our worship service. The goal is to never appear as if we are ‘performing’ but worshipping along with the congregants. But in essence we are ‘performing’ because to do otherwise we would not be in out top form to sing. This may be understood only by those leading. When I am in the congregation I certainly don’t pay attention to diction, timing, facial expressions, etc the same way I do if I am in front. We as leaders do have a certain responsibility to do our best to draw others closer to God. If one has never been involved in the planning of a worship service, then he/ she would not fully understand all involved. Each service is different. Many may worship with no planning involved and this is fine. Our congregation prefers more structure. My helping to lead music is an offering to God using my gifts and talents. I am able to worship thru singing. On another point, I see no reason why a person cannot worship God thru merely listening to the music. I have people say they just like to sit back and listen sometimes. I don’t feel like I always have to sing to worship. Thank you. Am really blessed by this article coz am also a worship leader in church. I think like u said we need to prepare ourselves well before we come out to lead the church in worship. We have to tune ourselves with the holy spirit and allow him to give us utterance to minister in songs of worship to the Most High God. Amen Jacqueline! We need to be ready in our spirit, so that the Spirit can flow through us in a worshipful manner to our God on high. God bless you! Hi, I just wanted to comment on what Jeff was saying. I totally agree with you Jeff about worship having become entertainment at times these days. I am a worship leader myself. I sometimes find it hard to get people to actually worship rather than watch. But the truth is only God can change their hearts. When I worship lead, I always encourage people to join in a worship God alone in that place. And I find that there is only so much I can do as a worship leader. We cannot actually go up to them and make them give that time to God alone and not watch. The best we can do is continue to pray for the hearts of the congregation. It’s not our job, but God’s job to change them. I really enjoyed reading this article. Found it very encouraging for me personally. Hello Sai! That was a wonderful comment. I really enjoyed the end of it when you imagine you are in Heaven with the congregation worshiping along side you. That is an awesome idea! Your response to Jeff was kind and full of truth. I can tell that the Holy Spirit led you to write it. May God bless you always! Awesome post Derek! 🙂 Thank you so much. I am actually in preparation now for tomorrow’s service and just so happen to surf the web for ideas. Much of what you said I either already do or know to do and it was encouraging to read this. I will print this out and post. I wholeheartedly believe in doing things in a spirit of excellence so love how you placed so much emphasis on preparation. It is everso important and as a Worship Leader I have found it inviting for the holy spirit to move more freely when done as opposed to my fleshy self being on display ha ha. Thanks again my dear brother in Christ. Feel free to post more or even write a book, if you haven’t already. It may just be basic to some however to others such knowledge is priceless! May Grace and Favor always be yours. I really like your advice to practice. As they, practice makes perfect. Whether you are performing at a small church or at a big one, it is normal to be a little nervous. However, if you are practicing frequently, your nerves shouldn’t be as high. Do you have any other tips about preparing for leading worship music?